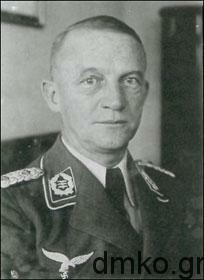 General Hellmuth Felmy, commanding officer of the 68th Army Corps. During the Nuremberg trials and the so-called “Southeast case”, Felmy was condemned and served a sentence of three years in prison for an act of which he had not been responsible and of which he was not aware. Nevertheless, he himself had in other instances ordered similar “atonement measures”. 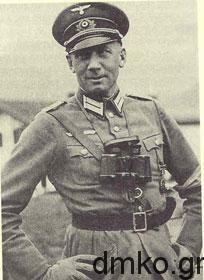 General Major Karl von Le Suire, commanding officer of the 117th Jäger Division [infantry division]. He undersigned the “Operation Kalavryta”. He died in 1955, imprisoned by the Soviets. He was buried in his birthplace in Bavaria with full military honors. Colonel Julius Wölfinger, commanding officer of the 749th Regiment. He was appointed commander of the “Operation Kalavryta”, but due to his injury in a car accident, the command of the operation was assigned to Hans Ebersberger. 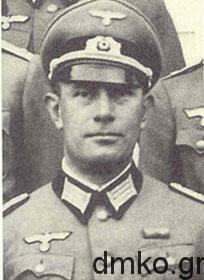 Major Hans Ebersberger, commanding officer of the 1/749 Battalion. Ebersberger carried out successfully and unwaveringly the “Operation Kalavryta”. He died in the East Front. 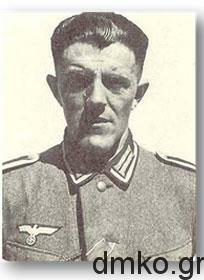 Lieutenant Willibald Akamphuber. Akamphuber was the commander of the detachment. 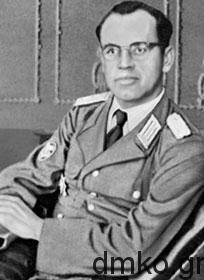 He died in 1979, in Austria at the age of 67. 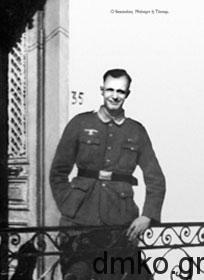 Corporal Konrad Döhnert. The face of Döhnert was imprinted more than anyone else’s in the memory of the holocaust’s survivors. He died in 1979, in Austria, at the age of 64.